It’s quite interesting to me (QI to my BBC-watching friends LOL!) 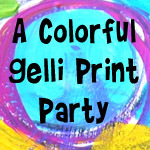 That when I do “art” I tend towards the messy, grungy, distressed look but when I design (like the Project Life Printables I did over the last couple of days) I am all about the clean lines and simple shapes. 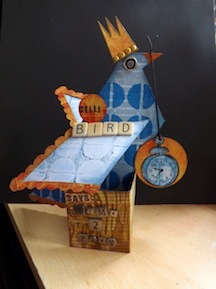 Not entirely sure what that says about me – maybe I feel more confident using tools others have developed (like stamps and inks) than I am creating from scratch? Not sure but I am having fun in both directions at the moment. 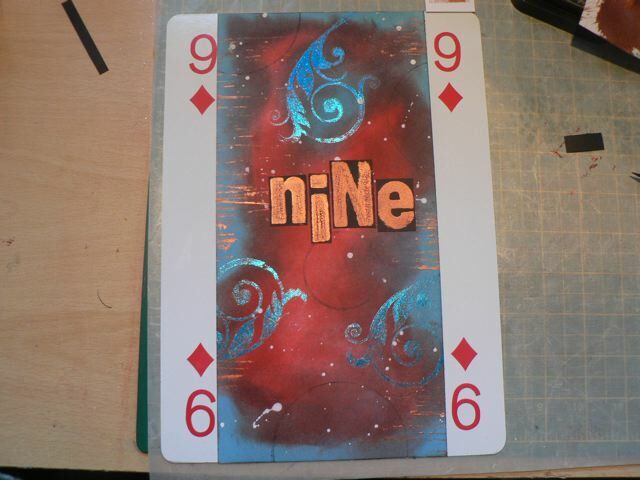 Carrying on with my BIG CARD project, this week we have the Nine of Diamonds. In considering the techniques I want to experiment with, I spend the weekend before looking at my stash. I am looking for things I have but have never used. This week, I pulled out a Glue Pad, some quite ancient foil sheets, a pristine stamp, and some cheap metallic copper paint. Quite an array. 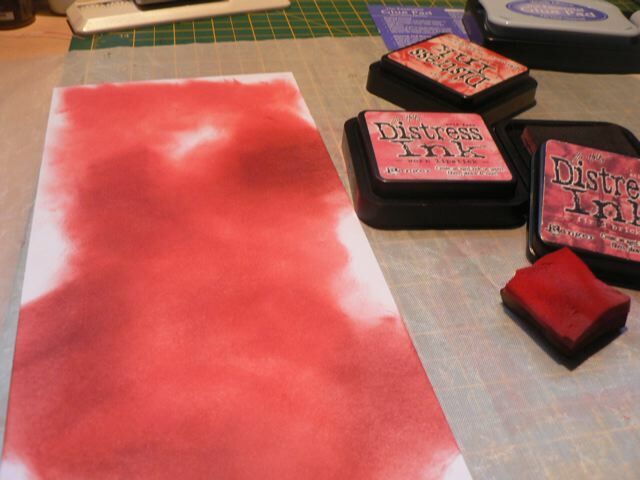 I know Distress ink is meant to be blended, but for this experiment I really wanted to use red and blue and not have the whole thing deteriorate into a muddy purple. I first smudged the Distress ink in Barn Door, Fired Brick and Worn Lipstick, but left some white areas, especially around the edges. I then smudged the Broken China in the white areas, letting some drift over the edges into the reds. You’ll see that in later photos – I’m trying not to be needlessly photo-heavy here. 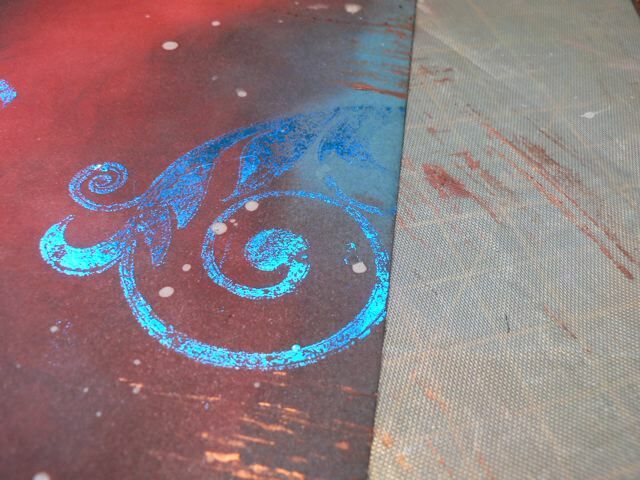 I dried the Distress ink briefly with the heat gun because I didn’t know if the foil might stick to it if it were wet. I stamped with my never-before used glue pad and then hit that with the heat gun, literally for a couple of seconds. 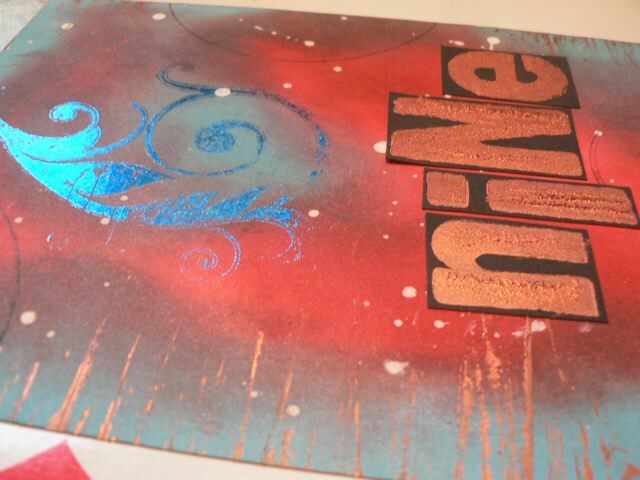 I did try foiling over it immediately and my opinion is a blast of heat makes the foil stick better. 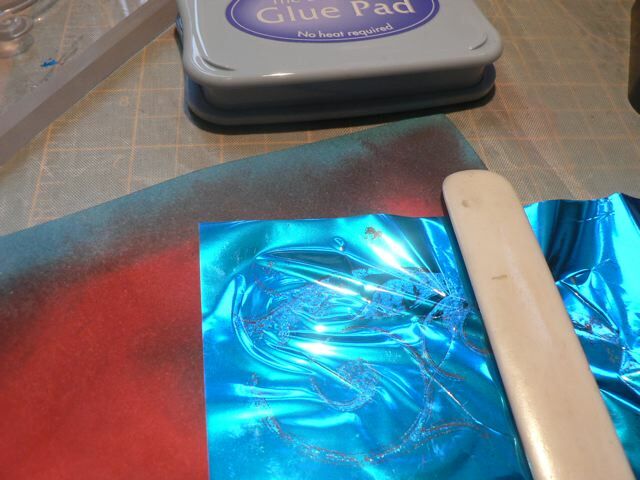 I laid the foil over the glue-stamping and rubbed over it with the flat edge of the bone folder – and in smaller areas rubbed with my fingertip. That is some intensely-blue blue! Using an old card (and yes, I applied the money to my Amazon account before I used it LOL!) I sort of pounced copper lines along the edges, pretty parallel. And here you can see a bit of the sparkle from the foil as well as the way some of the left-white areas are really blue. I stamped the number in the copper paint, but I also tapped the foam brush on the stamped paint while it was still wet to give the letters a rougher texture. Instead of using paint on a lid I inked the lid and stamped so the circles are fainter and more ghostly. a bit of spattered white paint and DONE. This one MAY have replaced the Jack as my favourite. I’ve never seen the foil with glue pad. I have read lots of places how people don’t like the Essential Glue Pad, which may be why I never opened it. I’m glad in this case I bought it then read the reviews, because I love it for this. I have a drawer full of foil sheets (pretty much all but gold and silver, because I think I bought the pack for those colours, used them up, and stuffed the remainder in a drawer!) so I can see playing with this a LOT. When the light hits it, and with the imperfect application of the foil over the Distress ink, it has such a cool look. And so the experiment continues. 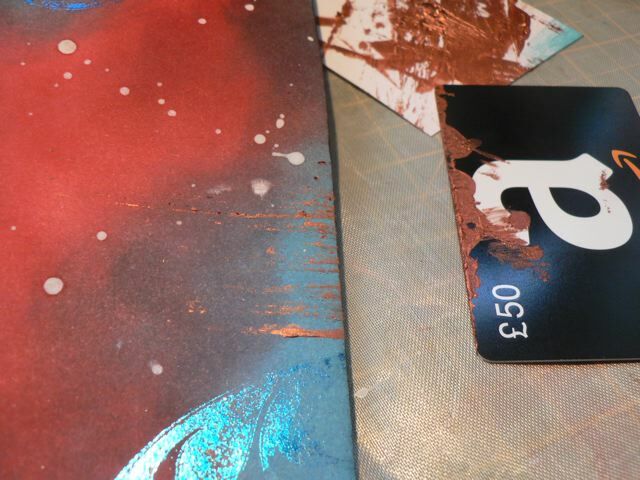 Categories: art, BIG CARDS, tutorial | Tags: cards, how-to | Permalink. NO! Versamark is NOT anything like the glue pad 🙂 http://www.craftcritique.com/2008/10/essential-glue-pad-by-tsukineko.html has some info about it. HTH! Lovin’ that foil technique! What is the brand of the foil and where can you buy it? The stuff I have is O-L-D. It’s called Art Accentz by Provocraft. But I think I’ve seen similar at places like Hobby Craft in the UK. I don’t think it is the same foil you use for hot-foiling. If I find some I’ll let you know via email. Thanks! I would love to incorporate that into some of my scrapbook pages! Let the search begin! Lovely MaryAnne. At least you have two styles. I tend to flit from style to style. Does that mean I’m a crazy mixed up kid?